It requires all your brain power and no equipment. Summer situations like beach days and long weekends call for equipment-free workouts that you can do outdoors. That’s when you should take advantage of this plan, designed by Maryanne Blake, a group fitness instructor at Equinox Dartmouth Street in Boston. The routine begins with a quick warm-up: “This phase includes a series of combinations that open the body up for the more challenging exercises that follow,” Blake says. From there you’ll perform a circuit of moves that blend high-intensity bursts like jumping with muscle-strengtheners like push-ups and lunges. “Because many of the moves require coordination, this routine challenges you mentally as well,” she explains. Science increasingly shows that you get the most out of workouts that engage your brain. Brian Robbins, a Tier 3 trainer at Equinox Darien in Connecticut, demonstrates Blake's sequence below. Do it at the park, on the beach, or anywhere you're spending time this summer to check cardio and strength training off your to-do list. 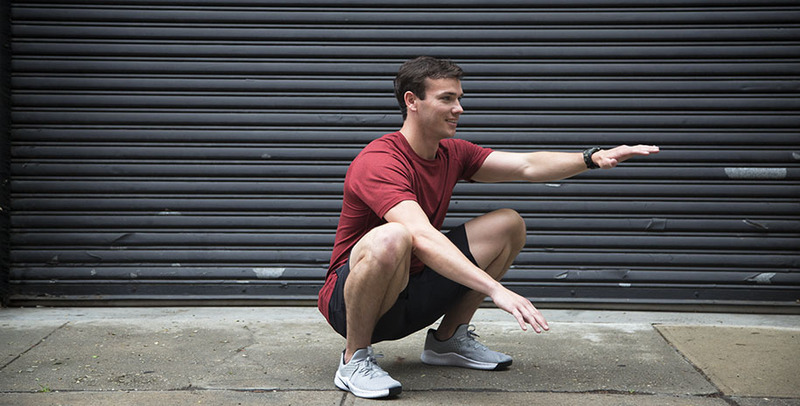 Stand with feet shoulder-width apart and squat as low as you can. Extend left arm at chest height as you press right elbow against inside of right knee. Holding squat, switch arms. Continue, alternating arms for 30 to 45 seconds. 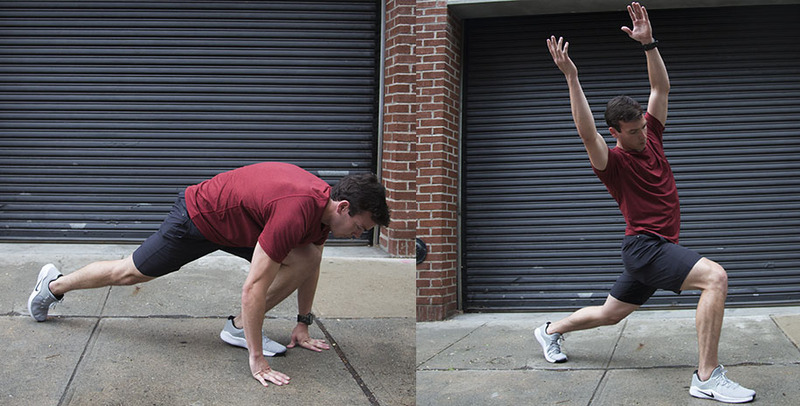 Begin in plank position, feet hip-width apart and wrists aligned under shoulders. Walk hands back to toes. From there, step left foot back so you’re in a lunge (a). Raise both arms overhead and bend sideways to the right (b). Place hands on the floor, step right foot back, and return to the start position. Repeat the entire sequence, this time lunging and bending on opposite side to complete one rep. Do 2 reps.
Do each exercise for 30 to 45 seconds in order, then repeat the entire circuit. Continue for 10 to 30 minutes, depending on how much time you have. Stand with feet together. Bend forward from hips and place hands on floor in front of you. Walk hands forward to plank position. 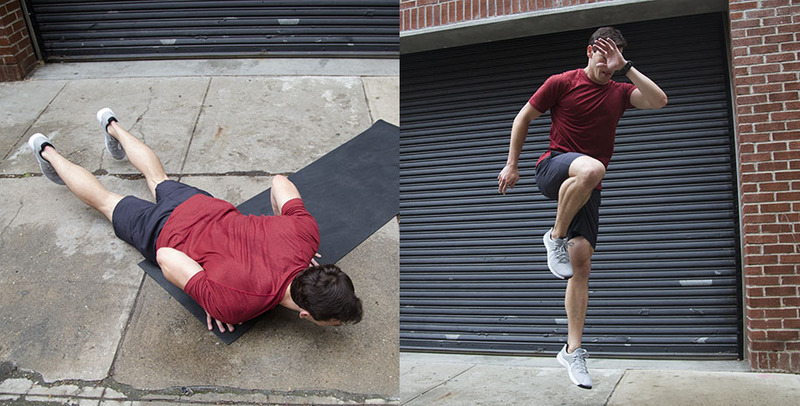 Perform one push-up (a), then walk hands back to feet and immediately jump up and to the right (b). Repeat the entire sequence, this time jumping to the left. Repeat jumping in the opposite direction each time. Stand with feet together. 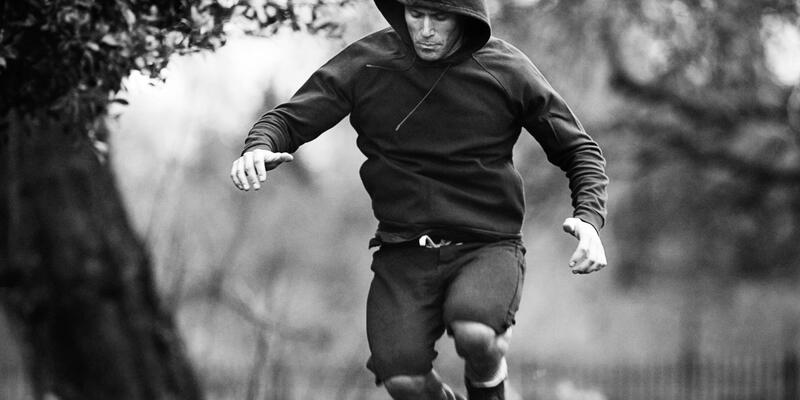 Push off left foot as you jump to the right, landing on right foot with left foot raised behind you (a). Immediately hop straight up, then land on right foot and hold for 1 to 2 seconds. Lower left foot to the floor and repeat the sequence to the left (b). Continue, alternating sides. 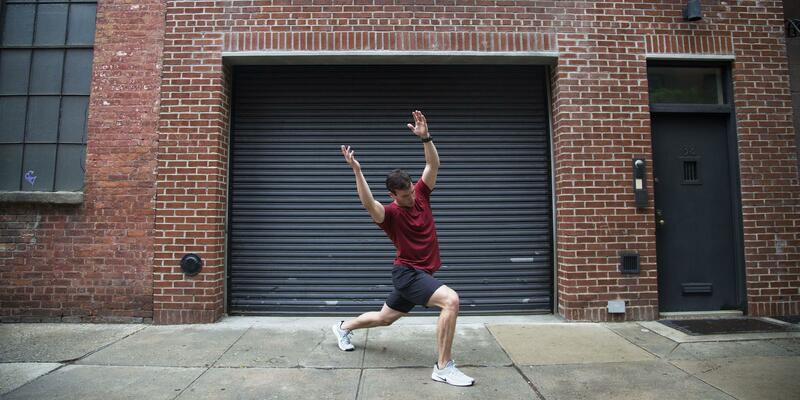 Begin in a lunge position with left foot in front of right (a). 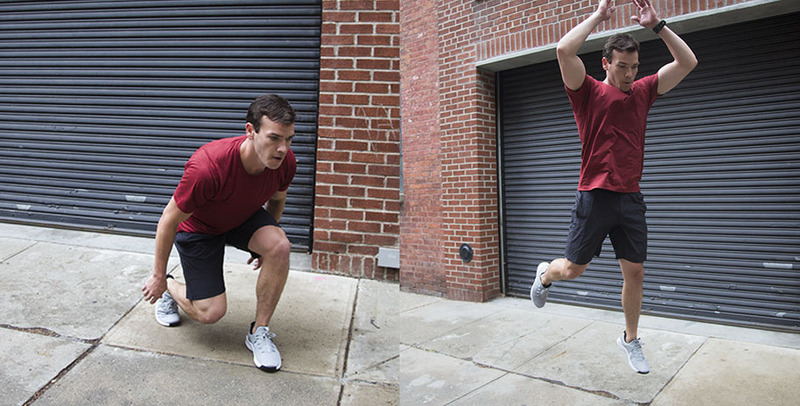 Bend knees, push off both feet, and jump to the left; immediately jump back to start position, then jump straight up as you switch legs (b), landing with right leg in front of left. Repeat sequence, jumping to the right. Continue, alternating sides. Stand with feet shoulder-width apart, knees bent and elbows bent. 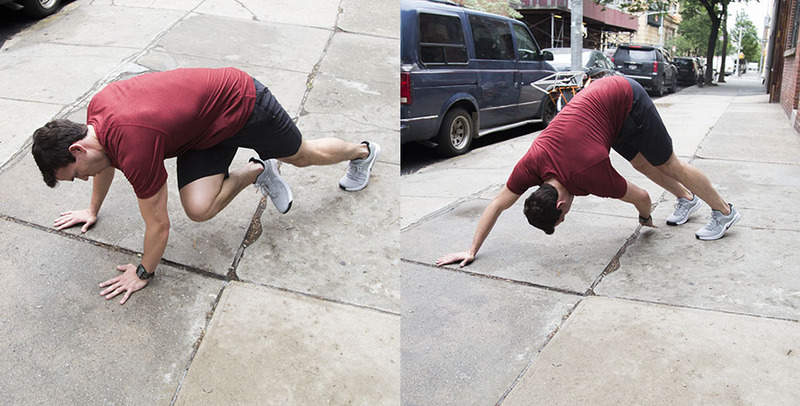 Quickly start jogging in place, then drop down to the floor (a), roll over to the right (b), and push up into plank position. Jump feet forward to hands and repeat, this time rolling to the left. Continue at a quick pace, alternating sides. Begin in plank position. 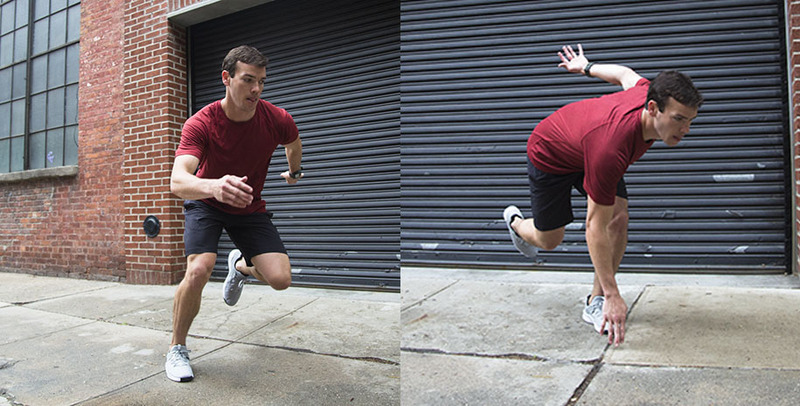 Hop right foot forward toward chest, then immediately switch legs for one rep (a). Do 20 reps, then return both feet to start position and drive hips up toward ceiling (like a downward-facing dog) and reach left hand toward right toes (b). Return to plank position and repeat, this time reaching right hand toward left toes. Repeat once more on each side, then begin with mountain climbers again.